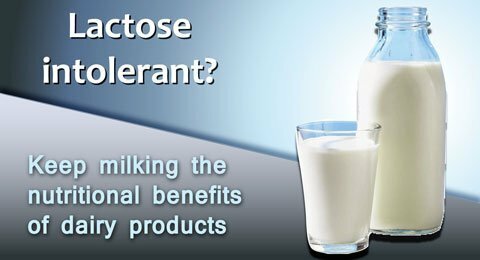 Many people who have lactose intolerance are mistakenly doing something very wrong – avoiding dairy foods. Described around 400 B.C. by Hippocrates, lactose intolerance is a condition affecting numerous individuals in which avoidance of dairy products is the main method of reducing symptoms. However, shunning milk products is no longer a necessity and could inadvertently lead to missing out on key nutrients and increasing chances of more serious conditions. Knowing the facts on lactose intolerance can help reduce symptoms while still obtaining optimal nutrition and enjoying dairy foods to their fullest. What is lactose and why am I intolerant of it? The carbohydrate lactose is a disaccharide, meaning it’s composed of two sugar units, glucose and galactose, linked together. Lactose is the sugar found naturally in milk and many milk products. After consuming dairy foods, lactose needs to be broken down into the monosaccharides, glucose and galactose, to be absorbed in the intestinal tract. For that to happen, an enzyme called lactase that is active in the small intestine is necessary to split glucose and galactose apart. If lactase levels are low or absent, the disaccharide lactose will go unabsorbed on into the large intestine or colon, and will get fermented by millions of bacteria residing there, resulting in unpleasant symptoms. What can cause lactase deficiency? Primary lactase deficiency – This is the most common reason and occurs when lactase production decreases, beginning around age 2 and persisting into adulthood. In some people it can be inherited. Secondary lactase deficiency – This type of deficiency is often the result of an infection or a disease such as celiac disease which can destroy the lining of the small intestine. Congenital lactase deficiency – This is a very rare cause of lactase deficiency in which the small intestine produces no lactase enzyme from birth. Abdominal pain or cramps, bloating, gas, diarrhea and nausea, occurring within 30 minutes to two hours after eating lactose-containing foods. The unpleasant symptoms are benign and are what makes people stay away from eating dairy foods. How prevalent is lactose intolerance and does it vary by ethnicity? Worldwide, about 65 percent of adults have some degree of lactose intolerance. Since the ability to digest lactose evolved only within the last 10,000 years and was dependent on what areas of the world utilized dairy farming, it varies widely by ethnicity. Those of northern European decent have only a small percentage of the population unable to digest lactose. However, lactose intolerance is more prevalent among other races such as West African, Arab, Jewish, Greek, Italian, Hispanic and Latino. Ethnic groups with extremely high rates of lactose intolerance of up to 90 percent or higher, are Native Americans and Asians. In the United States, it is estimated between 30 and 50 million people are lactose intolerant. Is lactose intolerance the same thing as a milk allergy? How do I know if I have lactose intolerance? Many people who often have digestive discomfort after eating will self-diagnosis it as being lactose intolerant. Unless they go to a physician for proper testing, they very well could be unnecessarily avoiding dairy foods and actually have a more serious condition that mimics lactose intolerance. As an example, celiac disease, irritable bowel syndrome, inflammatory bowel disease, GERD, and overuse of laxatives can all have the same symptoms as lactose intolerance. “If you have significant stomach pain after you eat, it might be a good idea to ask your doctor for either a hydrogen breath test (which has been deemed most accurate) or lactose intolerance test which measures your blood sugar after you consume lactose,” advises Dr. Samadi. If I’m lactose intolerant, why can’t I just eliminate dairy foods? When we eliminate an entire food group like dairy, it can be difficult to get in important nutrients for good health. Dairy foods contribute nine essential nutrients: Vitamin B12 , riboflavin, protein, calcium, potassium, zinc, magnesium, vitamin A and vitamin D. By including dairy foods in your diet, it also leads to better health outcomes of adequate nutrient intake and diet quality, better weight management, and reduced risk of osteoporosis, hypertension, colon cancer, metabolic syndrome and diabetes. So, I’m lactose intolerant. How can I include dairy foods in my diet? Start off with small portions of dairy foods to see what you can tolerate without getting symptoms. Many people can consume up to 1 cup of milk without symptoms. The amount and type of dairy food that’s tolerable can vary among individuals. Consume lactose-containing foods like milk with other foods which give the body more time to digest it. Add milk to soups, pour it on cereal, blend it with other foods in a smoothie and it can be more tolerable. Purchase lactose-free milk in which the lactose is predigested. This milk is the same thing as regular milk, with the same nutrient content and can be used in cooking. There are over-the-counter lactase enzyme tablets that help digest the lactose in dairy after you’ve consumed it. Most yogurts should be well-tolerated as they contain live, active cultures that already have broken down lactose. Natural cheeses, such as Swiss, cheddar, colby, Monterey Jack and mozzarella, are already lower in lactose with less than 1 gram of lactose in a 1.5 oz. serving. Chocolate milk may be better tolerated than unflavored milk. Lactose is mainly found in dairy foods but be aware that it can also be present in bread, dry cereal, candy, or pizza as examples. Read food labels, looking for the words “milk” or “lactose” and they may need to be eaten in moderation. The overall objective of managing lactose intolerance is to keep symptom free while meeting calcium needs along with the other nutrients dairy foods provide. With some planning ahead and guidance from a physician or a registered dietitian, dairy foods can confidently be consumed by people with lactose intolerance and still “milk” the nutritional benefits they have to offer. Sources: Webb, D. (2015, May). The latest on lactose intolerance. Today’s Dietitian, vol. 17 No. 5, 38-41.; Midwest Dairy Association; National Dairy Association; Lomer, M.C.E., Parkes, G.C., Sanderson, J.D. Lactose intolerance in clinical practice – myths and realities. Aliment Pharmacol Ther. 2008;27(2):93-103; Dairy Council Digest. Lactose intolerance revisited. Sept/Oct 2008; vol. 79 No. 5. Cheryl Mussatto MS, RD, LD, is a registered dietitian and an adjunct professor at Allen Community College, Burlingame, where she teaches Basic Nutrition, and at Butler County Community College, Council Grove, where she teaches Therapeutic Nutrition. She is also a certified health and wellness coach. She writes Eat Well to Be Well, a column about health and nutrition, and is also a blog contributor for Dr. David Samadi at www.samadimd.com. Contact her at [email protected].